The CLWT-115™ is a research quality closed loop wind tunnel that provides a convenient, accurate system for thermally characterizing PCBs and individual components at controlled temperatures from ambient to 85°C. 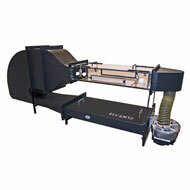 The CLWT-115™ wind tunnel produces air flows up to 5 m/s (1000 ft/min). With customization, it can generate flows up to 50 m/s (10,000 ft/min) using orifice plates (available optionally). The clear Lexan test section lets the user view the test specimen and allows for flow visualization. Unlike open loop wind tunnels, the CLWT-115™ recirculates internal air. This allows the system heater to quickly warm the air to a specific temperature. than traditional, closed loop wind tunnels or environmental test chambers. The wind tunnel’s test section can be accessed from the top door or sides for mounting and repositioning of boards, components and sensors. Internal rail guides provide an easy mechanism to install test specimens of different sizes (e.g., PCB, heat sink). Instrument ports (6) are provided in the side walls of the test section for placing temperature and velocity sensors such as thermocouples, Pitot tubes and hotwire anemometers. Custom options are also available. Contact ATS for details. Recirculates air, allowing the air to quickly warm. Elevated temperature testing is a requirement in certain NEBS standards.